Carole Shiber has been putting her imagination to work in the home since 1989, when she sold her first hand-painted placemats and napkins to Macy*s New York ~ a $10,000 order which she single-handedly filled from her bedroom in Brooklyn, New York. Orders quickly followed from other neighborhood stores: ABC Carpet & Home, Barney’s New York, Henri Bendel and Fellissimo. Next came a personal appearance at Neiman-Marcus, with a trunk show yielding record sales. 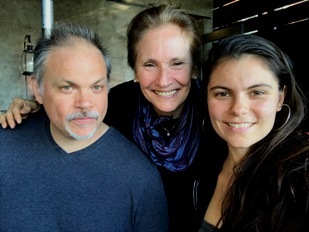 As a painter and conceptual designer, Carole Shiber continued to follow her heart and used her head to bring original ideas to often predictable tabletop design. In 1994, Carole met Bill Cochran. He immediately saw the magic and promise in her work, and was inspired to bring his own talents and vision to her fledgling business. Pioneering special die-cutting techniques and an innovative use of materials, Bill was able to bring even more invention to her original concepts and designs. This boosted the design capabilities and led to a more affordable product for more people. And with their fresh and friendly looks, and an ongoing presence at seasonal Gift and Home Textile Shows, Carole's one-woman cottage industry quickly grew to a successful art & craft business with lots of potential. Next came the $40,000 order from Williams-Sonoma, the big truck pulling up in front of her brownstone apartment to pick up 96 boxes of their uniquely hand-painted linen leaf and flower-shaped placemats and coasters ~ the driver admitting this was his first domestic pick-up ever. Now known in the tabletop industry for popularizing the sophisticated. die-cut placemat, Carole Shiber's artful designs and concepts have been licensed and have sold through many of our favorite "go-to" stores for years ~ retailers such as Macy's, Bed, Bath & Beyond, QVC, Linens & Things, Pier 1, JC Penney, Sears, Kohl's, SteinMart and Home Goods, while her innovative table linens, as meticulously hand-made in Brooklyn & Kingston, NY, and have been consistently selling to high-end stores and fine arts and craft shows since 1994, with plans for even more expansion. Having firmly established a permanent seat at our nation’s table, Carole ventured into the bath. Inspired to use the shower curtain as a giant painter's canvas, she applied her larger-than-life, nature-inspired images to shower curtains to create “getaway fantasies”, like scenery, and was licensed with Croscill Home. And simultaneously, she joined hands with San Francisco's Clay Art and Formation Brands, where her colorful creativity naturally took to ceramics and glassware, both with best-selling collections to national chains such as Macy*s, Linens & Things and Coldwater Creek. Carole's painterly and illustrative hand now also graces her own washi tape line, as licensed and distributed by Paper House Productions, currently top-selling at A.C. Moore and many online crafting outlets. With this latest success in a new category, she's been inspired to create more crafting, stationary and paper designs, which she's now beginning to find partners. Check out first Premium Paper Placemats, as she previews just a few of her latest ideas for her customers right here ~ with so many more on her drawing board! Early on, Bill saw Carole's shapely designs as interactive' that they could work together in interesting ways. What evolved was the creation of Interlocking Tablescapes, with Carole's leaf and floral placemats intermixing and layering for their inventive Tabletop Garden. 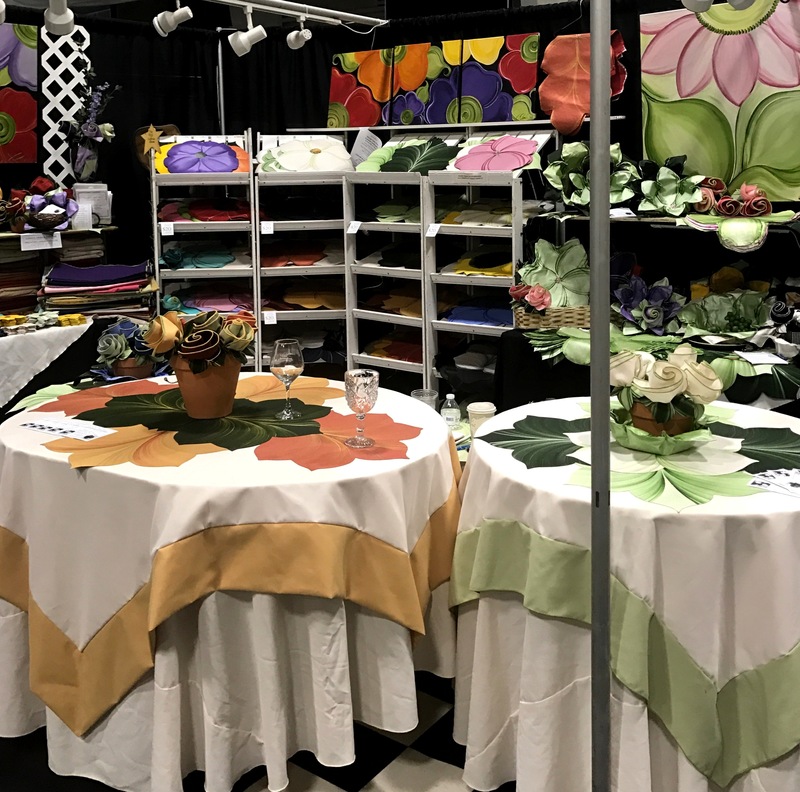 Bill then designed an interactive booth for the artful and informative demonstration of building one's own custom tablescape, inviting and directing the arts and crafts show-goer the freedom to play and experiment with their broad palette of shapes and colors. Table Crafting, as it is naturally called, combines assorted placemats, napkins and Carole's Leafy Napkin Rings (which turn their napkins into flowers) offers customized collections as unique as we all are! Calling his Art Table Garden booth his little "church of creativiity", Bill strives to bring joyful, special moments to their customers with humor and warmth, as he tours national flower and fine arts & crafts shows. We look forward to seeing you soon ~ to help create your special home decor ~ and wonderful memories around your table with family & friends.